With the new electronic gauges I find my self using the "Progressive" with Distronic car gauge on the left, Digital speedometer in the center. and Nav on the right, more often than not. I was wondering if everyone else did too. 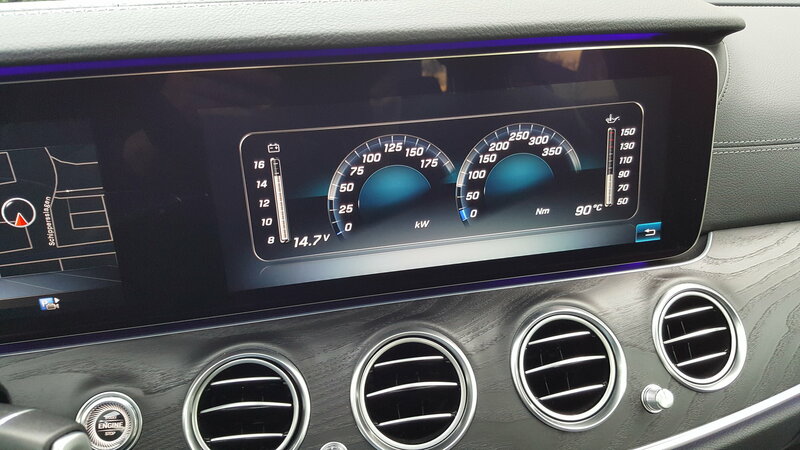 I find the info of some of the other gauge options such as eco, and consumption display as somewhat counter intuitive. Do some of you prefer Classic, or Sport? For those that have those digital gauges, what set up do you usually go to and what options do you you usually select? I use Progressive with radio info on the left and Nav map on the right. Progressive with trip on left and eco on the right. I have the entertainment display split with nav on the left and radio on the right. The right portion is sometimes used for traffic cams. Progressive, with trip on the left, map on the right. Progressive, assistance services (distronic) on the left, navigation on the right. Classic with speed on left radio center and trip info on the right. Classic (sometimes Sport but not Progressive) with mileage in the center, then tachometer then navigation to the right and left of the radio stations! Progressive with distronic on left, speed center, eco on right. When cruising winding roads I use Sport with speedo on left and rpm with g-force center. I use Progressive" with Distronic center bottom of the Digital speedometer. On the right, from reset gas/eco on left from start gas/eco. MB could have done a whole lot better with the Sport IMO. Hopefully with the new system and updates in the future they will have better options. I have a 2017 so don’t have the new system. My car has P3 package and well advanced compared to other vehicles but already obsolete compared to new system MB system. I would have like to have seen better options or more gauge selections than we currently have. I was expecting at least 5....3 isn't much to choose from; not much difference between sport and classic IMO. Occasionally I display engine data on the entertainment display. I just give a voice command "engine data". I'm surprised how little power is actually used when steady state cruising. Can you post a snapshot of engine data. I assume this is 18 and above that has this feature. I do this as well...it is interesting to see and compare in different drive modes. I like to use the engine data on the MM display too. Honestly it looks cool. I've always wondered...other than looking cool, what purpose does a G force meter help you in your driving? unless you’re in NASA and it happens to be your turn to launch in a rocket, probably none . But it does look cool on the display! Classic - speedometer on left, RPM with center Eco on right, speed or milage in the middle. Right screen - navi left, radio right. Occasionally go to Sport to change it up. Progressive is too futuristic for me. Thanks for reminding us about the Engine Data view on the right screen. Fun to see that! Is there a fast way to access engine oil and water temp gauge? I use progressive and it's not displayed on that screen unless I go through many menu options on the left panel. I like to know when the car is warmed up and ready to roll.